The cause of the failure in loop release is the wrong timing of the withdrawal and twist of the scope. In this chapter I will explain the theory of the successful loop release. The cause of the failure in loop release is withdrawal and twist of the scope are not well coordinated. When the amount of withdrawal and twist are properly coordinated, the scope will not fall even if the tip is not hooked to the fold. In the sigmoid colon, release the loop as soon as the tip passes SD. The hook is most firmly fixed when the bending of the scope corresponds to the acute angle of SD. If you push the scope further in fear of falling the scope, ironically the scope would be more likely to fall because the SD angle will become obtuse for the scope's elasticity (Chart 14-1). When releasing the loop, the tip of the scope will fall if you start to twist the scope immediately after withdrawing it. Make sure to withdraw the scope straightforwardly first, without twist, to minimize the circular loop (Chart 14-2). It feels heavy with the right hand when the loop is minimized. Why would the scope fall when twisted soon after withdrawal? This can be explained with "the two-board theory" (Chart 14-3). During the release of a loop, the circular loop has to stand. When the space between two boards is narrower than the diameter of the circular loop, the loop cannot stand, therefore, the release is impossible. If you start to twist the scope immaturely when the circular loop is large, the loop can't stand in the abdomen and the scope would fall during the release of the loop. First withdraw the scope straightforwardly and minimize the circular loop. CHART 14-3 WHY WOULD THE SCOPE FALL WHEN TWISTED SOON AFTER WITHDRAWAL? After minimizing the circular loop, start to withdraw and twist the scope 180 degrees. The amount of withdrawal is equivalent to the circumference of the minimized circle. The diameter of the minimized circular loop is approximately 10cm, so the length of withdrawal should be about 30cm (Chart 14-4). When the withdrawal is halfway the loop release would be incomplete, and the scope would bow again with another pushing. Make sure to withdraw the scope enough length. For loop release, the right thumb works as the "angle sensor". Before the release, the thumb nail is facing upward on the scope. After the release is completed, the thumb nail is facing downward. The scope creates the minimum circle when releasing the loop. Practice and learn the loop release with the scope on a bed (Chart 14-6). Make an alpha loop on the bed and put a pillow on the tip of the scope as a weight and try to release it. First, put the right thumb on the scope and withdraw the scope straightforwardly. You can sense heaviness with the right hand when the circular loop is minimized. Then stop withdrawing and twist the scope 90 degrees clockwise. And withdraw the scope 30 cm while twisting the scope 90 more degrees in the same direction. Practice and learn the coordinated movement of withdrawal and twist. Push the end of the scope with a pillow. First we will make an alpha loop. At the beginning I draw straight. It gradually becomes more difficult to make a minimum circle. When making the smallest circle stop pulling and rotate 90 degrees. The remaining 90 degrees will be pulled again while turning. The thumb is right at the top right and rotates 90 degrees with the smallest circle and is just beside. As you pull it, turn it 90 degrees and turn it straight down. The amount pulled is 3 times the diameter 10 cm and is 30 cm. I will remember this amount with a firm body. Again, I will make the smallest circle. I stop pulling and rotate 90 degrees. Turn the remaining 90 degrees while pulling 30 cm. You can release the loop without falling out anywhere. I also practice reverse α loop release. Pull straight ahead to make the smallest circle. Rotate while pulling the remaining 90 degrees 30 cm. 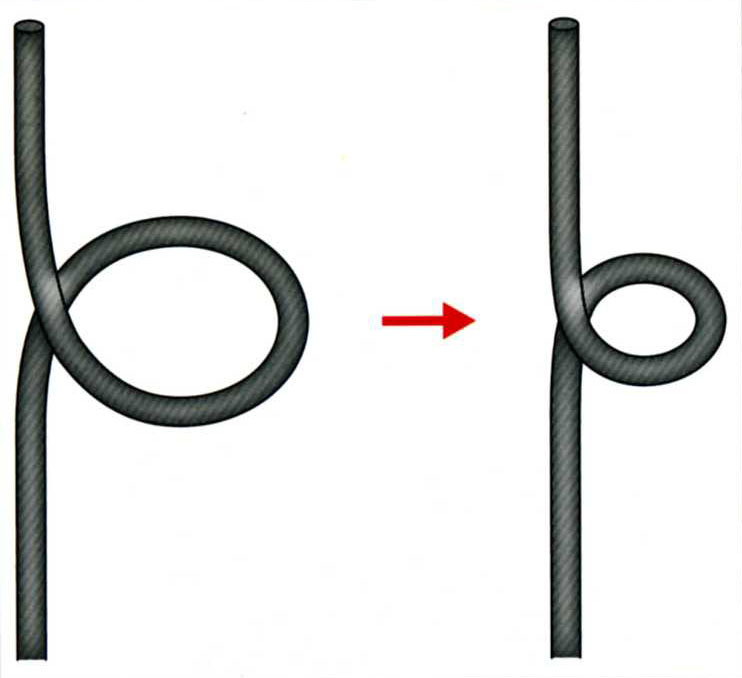 This is reverse α loop release. I will practice it many times till it becomes smooth. The diameter of the minimized loop is different depending on the scope. It would be smaller with a thin or soft scope, and larger with a thick or hard scope (Chart 14-7). Therefore, the loop release can be difficult when a thick scope is used for a thin person since the minimized loop is too large and there is enough space for the loop to stand. In such a case, make the scope less stiff or change the scope to the thinner one to make the circular loop smaller. Also, in order to "widen the space between two boards", to direct the patient to relax their abdomen or to anesthetize the patient. Changing the patient's position from supine posture to decubitus posture can also be effective. 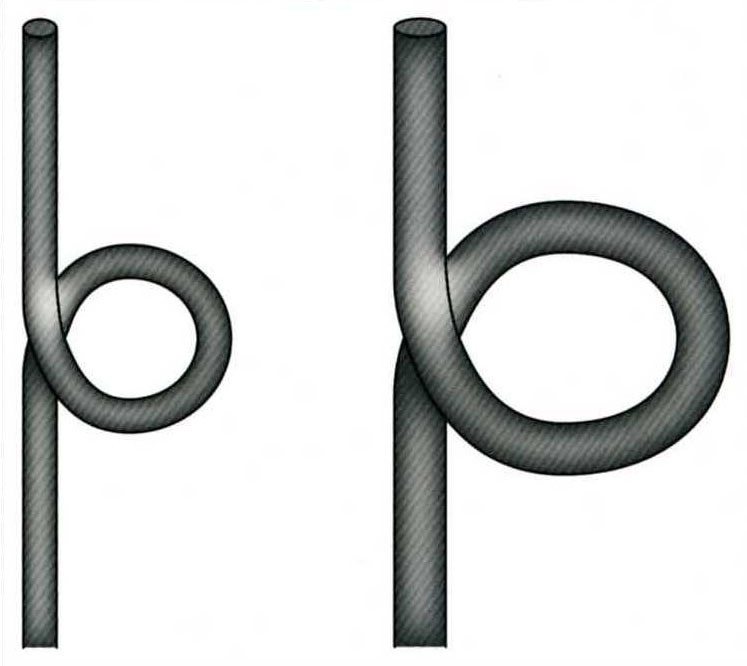 The thick scope as in the picture on the right has a larger minimized circular loop, so sometimes it is difficult to release the loop in a thin person.